Technology and science impact every sphere of human life. They bring dreams to reality augmenting reality, tools, personal and professional lives. Nowadays, scientists find new ways to engage with touch for visually impaired people as well as for business enabling reasons. On the range from daily activity to life-saving equipment, human touch becomes a sensor to control and navigate through lives. Tech companies are working on enabling screens to transmit the physical features of the products. For instance, imagine if users could touch the wool sweater texture through the screen of the phone instead of going to the brick and mortar shop. However, the new layers of the screens can solve deeper issues. Alibaba’s $15 billion R&D initiative Damo Academy has developed a silicon cover for a smartphone to aid blind people. 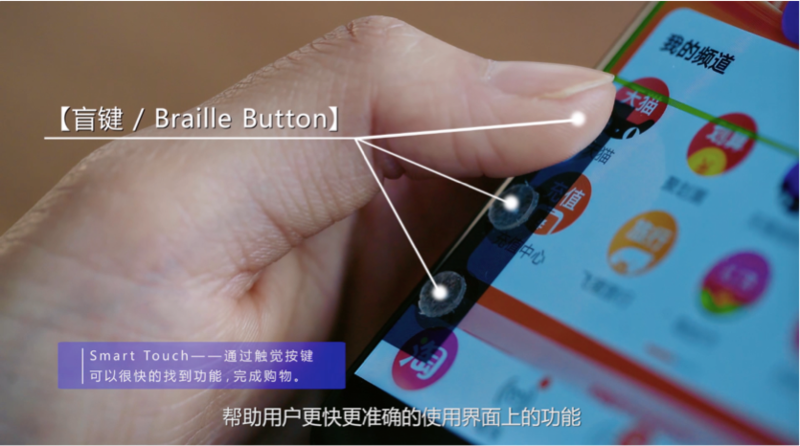 With a new haptic tape, visually impaired people get a braille function to their smartphones. In order to keep the technology available for public, the selling price of “Smart Touch” plastic sheet is $1. This is one of the first steps directed for equal access to technology. Multisensory engagement has been acknowledged by marketing professionals a long time ago. Author of Customer Sense: How the 5 Senses Influence Buying Behavior, Aradhna Krishna’s preaches the benefits of using as many senses as possible. Her Singapore experiment and other works in Michigan Marketing Lab has proven that sensory engaging products stay in the memory of user for a longer period of time. The professor defines sensory marketing as “as subconscious triggers that affect how people make purchase and consumption decisions”. Similarly, Supermarket Guru Phil Lempert predicts that FMCG brands will increasingly invest into tactile sides of their products. Engaging multiple senses enriches the full experience of an action. Human perception of taste, feelings, and other physical sense depends on the mood, smell and sounds at the moment of the experience. Nowadays, the virtual reality engages only the hearing and visual senses. The next step is offering haptic dimension and possibility to “touch” the virtual world. While the first utilization that comes to mind is the gaming industry. Virtual reality and tactile augmentation are used to treat arachnophobia. The University of Washington has experimented with mixed reality technology to help their respondent to overcome their fear of spiders. Such an exposure has shown as an effective treatment. Multisensory engagement allows experiencing the whole reality. The haptics technology market is expected to reach $29.84 Billion by 2020 at an estimated CAGR of 25.39% from 2014 to 2020. The first room “echo” engaged with human behavior and sounds. Second case study allowed visitors to explore the power of smart light. The visual imageries reacted on distance and movement with colors, shapes, and shadows. The next room took upon the tactical senses. Objects in the room allowed to control the technology. In a way, when multifunctional complex technologies dissolve into human environment, new types fo intuitive controllers will take place. The fourth and fifth presented dimensions offered smart furniture that collects data and the combination of all four rooms in one space. Tactile engaging technology is a potential to transform the human interaction in the domestic and working environments. Technology companies launch along with their computers the line of tactile objects. For instance, the variety of new editing consoles for designers and enriched keyboards. The Palette Gear has dials, buttons, and sliders helping smoother control over creative creation from colors to musical tunes. Similar, Microsoft Surface Dial substitutes buttons with the dial. The tactile functions add new opportunities for 7D technologies using shapes, surface, vibration, and other features. Haptic senses are irreplaceable for the healthcare sector. Medical personnel relies on the touch evaluation in the whole chain of patient treatment. Thus, it comes logically that the educational materials have to provide tactile experience along with other materials. “Our sense of touch is absolutely fundamental,” Dr Alastair Barrow, director of Generic Robotics, told the audience at a recent RAEng haptics seminar. “It’s the first sense to develop in the womb and it’s an ever-present always-on protector.” Dr Barrow with a team has set up a number of simulators for surgeons training. Haptics can simulate the feel of different tissue types. It is essential for students to get their practice on virtual patients. Moreover, such technology will impact on the development of telemedicine. Ideal haptic translation will allow doctors to perform various surgeries on distance with the real-like accuracy. ResearchAndMarkets reports that the global virtual patient simulation market will grow up to $1.49 billion by 2025. Multisensority makes technology more human-like. Ability to engage with one of the prime senses open a new world of possibilities.Starting from engaging visually impared people an dtraining med personal finnishing with improved marketing strategies and entertainment. Entertainment players already cooperate with art and tech partners to create new experiences for their users. Every industry can challenge its product development to engage with human touch. Haptic feature can be a future post-screen technological revolution.